We all know that every year Santa makes a list and checks it twice to see who’s been naughty and who’s been nice. 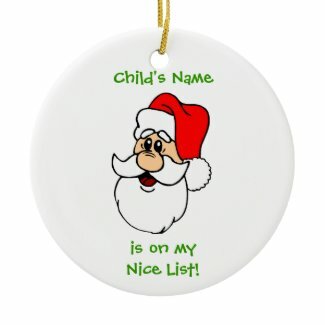 But what does it take, exactly, to get on the coveted Nice List? Well, the rules are a little different in each household. Santa knows that parents each have their own unique set of rules and even kids in the same house may sometimes need to work especially hard on certain behaviors. 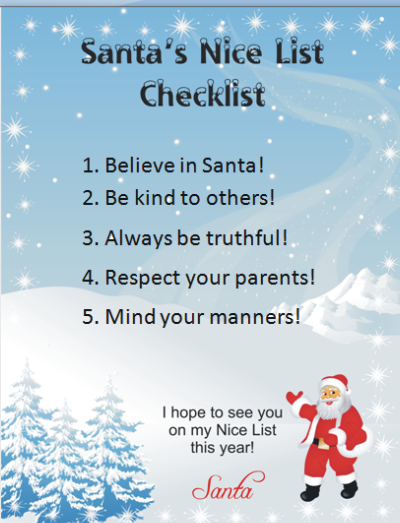 So Santa’s helpers at the North Pole decided to create this free Nice List checklist that parents can personalize. It’s a Microsoft Word document that has space for you to write in the five most important behaviors your child needs to demonstrate to get on Santa’s Nice List this year. When you click the image below, it will open the Word document and you can type in any five behaviors. (Behaviors shown on the image are just suggestions and can all be changed). Then print it out and give it to your child as a reminder that Santa is always watching! It’s easy to edit again and again, so you can change the list for all the kids in your family and again in coming years. It’s a great way to make sure your kids get on Santa’s Nice List this year! Click to open a Word document and customize your own checklist.